Today I'm going to do the second part of my priming and setting post, which is about (surprise surprise) the setter I've started using. As I explained yesterday I'm trying to start putting more effort into what I do to my face before and after make up and after falling in love with my Rimmel primer I wanted to try using something to set my make up once I've finished applying it to see if it would make it last even longer and look even better! At only £7 for a 100ml bottle that will last you absolutely ages because you only need a few sprays to cover your whole face, I think it's such a good value product! Particularly considering it's from the Body Shop and not just a regular drug store. To start with the scent is really lovely and fresh, as well as well as nice and subtle on your face so it doesn't feel like your spraying any harsh heavily scented chemicals on it. At first I thought that I'd only be interested in how long it would make my make up last, but I now also love the way it softens your make up to give you a nice dewy, glowing complexion, which ensures your face doesn't look unnatural, overly matte or too powdery. So now If I don't have time to top up my actual make up, but want a bit of a boost then I'll spritz this on for a bit of refreshment. I feel like this product, combined with my Rimmel primer, has completely got rid of the annoying dry patches of skin I used to have on my forehead and keeps my face feeling moisturised all day. And as well as my dry skin disappearing, I've also noticed that my skin is much clearer (touch wood!) 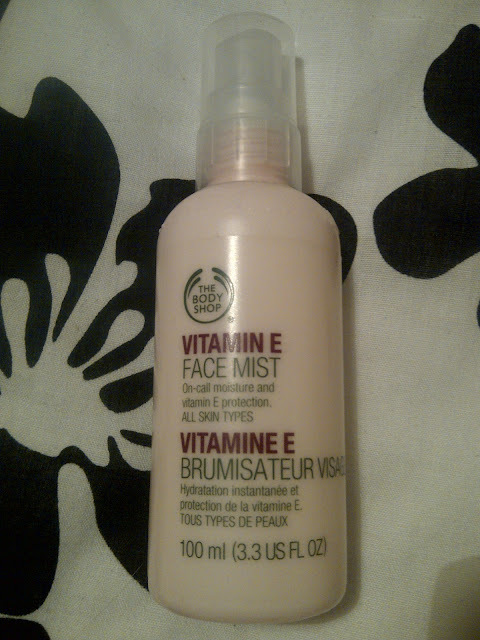 and I'm sure starting to use this product everyday has something to do with it as vitamin E is so good for your skin. So overall I'm ridiculously happy I've added a primer and setter to my make up routine and it will be a long while till I feel the need to look around for a setter that beats my vitamin E face mist (although there are other products in the range that I'm now tempted to try out, oops!). Have you tried this face mist? or do you use a different product to set your make up? I've had another long day of rehearsals and show type things, including the 'Alice's Adventures in Wonderland' city rally, where we go into town in costume to get publicity for our show. I must say I'm now rather looking forward to having a week off from Pop Tarts and just chilling tonight with a bit of take me out and nail painting! I hope you've all got fun Saturday nights planned! I've been looking for a spray like this, a definitely going into the Body Shop next time I'm out, for some reason I never go in. this product sounds incredible, I didn't even know that this sort of thing existed! I really want to try it now! I really want to try this now setting sprays can be so expensive, Urban Decay's all nighter is about £16.